My mates will tell you that I love a course. Over the years I’ve whiled away my spare time at various adult education centres – mostly doing acting classes – but since I’ve been on maternity leave I’ve branched out and tried some other things, baby in tow. In my head, I’m a very crafty person (as in making stuff, not the sneaky variety) but actually I have very little evidence to back this up as I rarely make anything and what I do is of questionable quality. Anyway – getting to the point – I recently enjoyed a few ceramics and painting classes with visual artist, ceramicist and printmaker Hannah Redpath. Hannah was highly recommended to me via a friend who did her classes with her NCT group, so I gathered together some local mums and for a few lovely Friday mornings we got together with our babies, chatted, drank tea, ate cakes and painted. It was heaven! There is something so massively therapeutic about painting something. I painted a couple of bowls, a plate and Miranda painted on canvas (me swirling her tiny painted fist over a canvas, basically). I also took a print of Miranda’s foot on a plate. I don’t think Emma Bridgewater needs to be quaking in her boots, but I’m quite pleased with my little creations. Hannah is absolutely lovely and runs classes from her studio in Streatham and also is happy to teach from other people’s homes around South London. She supplies all the materials needed, plus cake. 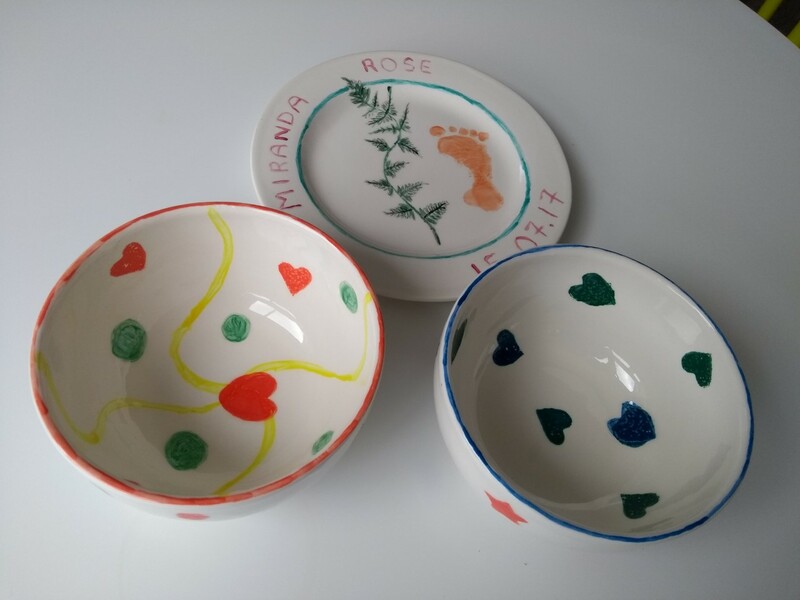 As well as the parent and baby classes, Hannah is hosting one-off soft clay build your own plant pot/platter/serving dish/vase parties with wine and nibbles for evening workshops. Sounds like the perfect night in to me.